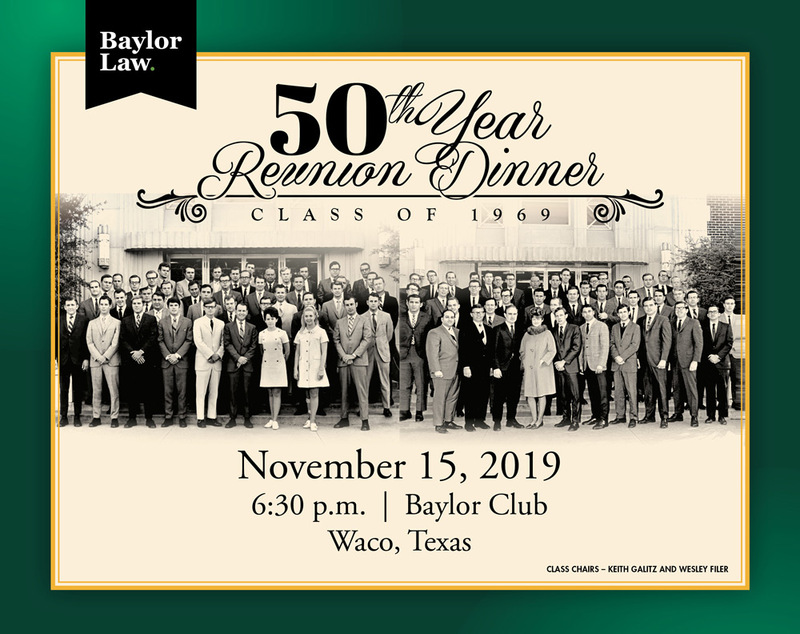 Friday, November 15, 6:30 p.m.
Join your Class of 1969 for dinner at the Baylor Club. Join us for tailgating fun and eats! All Baylor Lawyers and current law students are invited to join Dean Brad Toben, Dean Leah Teague, faculty, and staff at the Sheila and Walter Umphrey Law Center for a tailgate prior to the football game. Families and guests are welcome. Baylor Law T-shirts and tours of the building will be available through the Student Bar Association. Football Tickets: Baylor Law does not have football tickets available for purchase. If you are in need of tickets, we encourage you to call the Baylor Athletics Ticket Office at 254.710.1000 or visit online ticket resources such as Stubhub.com. **RSVP and online credit card payment must be received by November 8. Reservations require 48 hours cancellation notice. and ask for Baylor Law Tailgate. Reservations require 7 day cancellation notice. Two-night minimum for all home football games. Questions? Please contact Katie Casper or 254.710.4346.